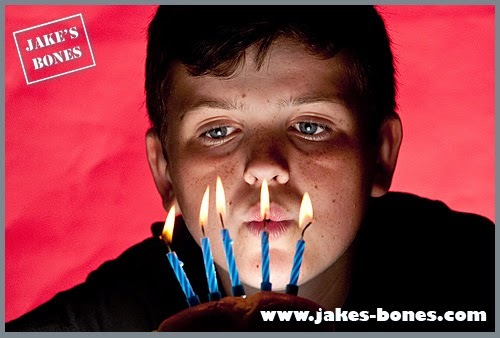 You are here: Jake's Bones > Five years of blogging ! Five years of blogging ! It is now EXACTLY five years ago today when I wrote my very first blog post, which was about the broken swan skull I found in my local wood. I never, ever expected what would happen in the next five years ! Since then I have written over 322 posts and I have had 1,658 comments, but I'm still writing more or less the same way, about once a week, about bones I find, wildlife I see or places I have visited. 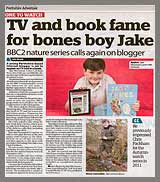 But I have also been on the TV, radio, in newspapers, met some of my heroes, and even got my first book deal ! So for my fifth anniversary I have written my blog post early in the week and answered your questions about my blogging journey ! Most of the exciting bones I have ( like the leopard and snake ) have been sent to me from people all over the world rather than me finding them myself, but I have found some exciting bones while on my walks. I have three cat skulls, the two broken red and roe legs and my big stag skulls on my walks. I have found most of my good stag skulls in the poachers or gamekeepers pits, which are where illegal hunters or gamekeepers leave the rest of the deer after they have taken the meat. First of all, Sophie and I found out by accident that we were on holiday in the same place last week, and we met up ! Massive coincidence ! 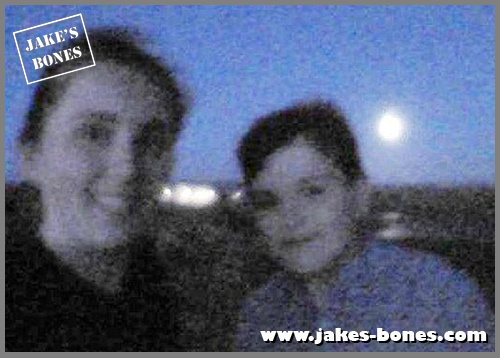 This is us on the shore under moonlight. I currently keep all of my bones in my room, but I am starting to run out of room. I'm not sure where I will put my bones when that happens.The bone I would most like to find is a red deer stag with a full set of antlers. The biggest set of antlers I currently have is eight points and a full set is about 14-16 points. The other bone I would really is a pine marten skull because I have been filming a pine marten so it would be really nice if I could find the skull. I keep it a secret because the person who told me asked me not to tell anyone else ! But I share so much information it's good to have some secrets. It varies a lot. It's a lot harder now to find bones which are new or different to the ones I already have, so although I find a lot, I leave a lot behind. I don't find bones on every single walk, but I do find something on most walks. I do, but I only degrease if I have to, and I usually don't usually have to. When a really fatty animals, like a sheep or bear, dies and it is left out in the sun, the fat soaks up in to the bones, which makes it greasy and a yellowy colour. Removing the grease is called degreasing. There are different methods of degreasing, one involving hot water which loosens and thins the fat so it rises out of the bone, and other ones involving chemicals. When I have really fatty animals, like my seal, I use a secret cleaning method which degreases the bones as the animal decomposes. 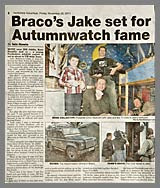 @jakesbones OK- where do you find the time. Aren't you just worn out when you get in from school? It takes a lot of time, not just writing on my blog each week (which takes a couple of hours at least) but also answering emails and writing other articles for magazines. I try to go on walks and write my blog posts at the weekend because I would not have the time to do it after school. But it DOES take up a lot of time, which is why it is a bit annoying when someone emails you, you go to a huge amount of effort to try and answer their questions, and they never say reply or say thank you. I have always written at least one post a week since I started. What I do different now is that I write my posts in more detail than before, because I know more about bones now, and I've always tried to write for people the same age as me, but also make it easy so people who are younger can understand it. 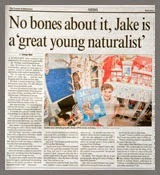 @jakesbones Have you come further than you thought you would in the last 5 yrs? Where do you see yourself in 2019? I did not think I would nearly this far five years ago. 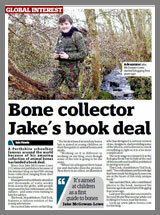 Five years ago, I saw my self collecting bones and still writing about it, but I never thought I would wrote as much as I have or going on TV. 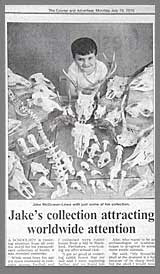 In another five years I will be 17, so I think that I will be in looking at going to university studying something on bones or animals. Because I'm blogging every week, that's meant I have to go out and find new things to blog about, which has meant I'm out in the countryside a lot. Having to write about it every week means you have to find out what you are writing about in detail, and it helps you remember about your finds. 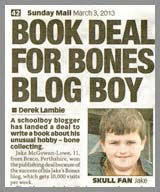 So I don't think I would have been as good a bone collector if I hadn't been blogging about it. Ben Garrod is the BBC TV Presenter and a friend of mine and we take the mickey out of each other ALL THE TIME on Twitter. He's been VERY helpful with a lot of things. Blogging or replying to comments is not boring at all ! The only thing I don't like is that I can only have 140 letters on Twitter, which makes it difficult to give detailed answers. And sometimes if I'm away for a few days, I come back and there are 100 notifications on Twitter, which I then have to work through. My favourite school subject is biology, and I am doing it in my second year. I'm not too sure about what I want to be when I am older. Definitely something to do with bones but I don't know what exactly. The thing that I am looking forward to doing this year is what I announced a few days ago: speaking at the Children's Bath Book Festival in October, doing a Q&A with the Ceebeebies presenter Jess French. That's going to be pretty amazing, especially as a lot of people I know through my blog are going to be there. 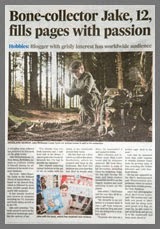 I've also just written an article for a wildlife magazine, so I'm looking forward to that coming out. The thing that I am hoping to do is to hopefully find a new wood to exploring in because I have almost ran out of woods near my house. And there MIGHT be other interesting things happening as well that I can't yet talk about, who knows ! thanks. I didn't expect to see my question on their, never mind the picture :) and well done on your blog, it is great!! 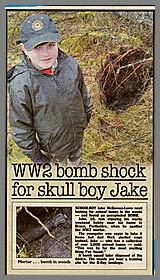 Hey well done Jake, congratulations and all the best for the next 5 years and beyond! It was a good question ! Ha ! Never thought I'd get to five years ! Was good to meet you ! Ha ! I'll be 17 by then ! Come to my talk in Bath !